Halloween is a fantastic time of year where people can let their creativity shine through. 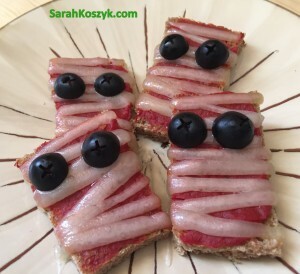 Planning and making our costumes, decorating the house, and making fun Halloween-inspired snacks are some of my favorite activities during Halloween. Looking around at all the different cobwebs, spiders, ghosts, witches, skeletons, and countless other types of spooky decorations is so inspiring and tons of fun. And many times these arts-n-crafts projects are pretty easy to do. 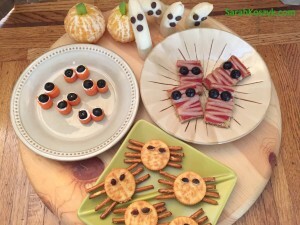 With all this creativity flowing around me, I had to share 5 fun Halloween treats that are simple to make and delicious to eat. Just adding that little extra touch of décor when you’re at home can be entertaining for the everyday afternoon snack. 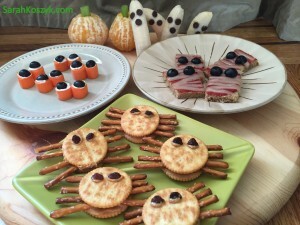 When food looks “scary,” it tastes even better. How to make them: Cut the banana in 2. If it’s a long banana, you can make 4 ghosts out of it. 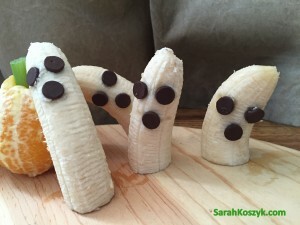 Using the pointy tip of the chocolate chip, push it into the banana and use 2 chips for the eyeballs and 1 chip for the mouth. How to make them: Spread the cream cheese or peanut butter on the bottom side of the Ritz crackers. For 1 spider, break 4 pretzels in half. Place 4 sticks on each side of the cracker so you have 8 legs total. The spread helps hold everything in place. 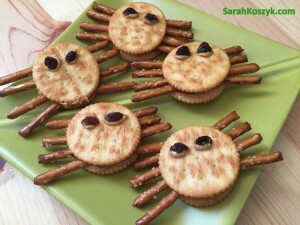 Make 8 Ritz crackers with the spider legs. Place the other 8 crackers on top to cover up the legs with spread-side down. Put a little cream cheese or peanut butter on 2 raisins and place on top of the cracker for the eyes. How to make them: Peel the oranges. Cut the celery stick in half on the diagonal. 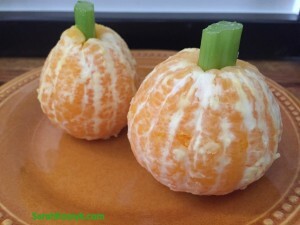 Stick the celery stick into the hole of the orange to make the pumpkin stem. How to make them: Slice the crusts off the bread and discard the crust. Cut each slice of bread into 4 squares so you have 8 total. Spread the tomato paste onto the bread. Slice the cheese in half. Next, slice the cheese into little strips. Place the strips across the bread like a mummy. Slice the tips of the olives off (the rounded area). Use the rounded area for the 2 eyeballs on each mummy. Place the mummy pizza into a toaster oven or under a broiler for 1-2 minutes until the cheese is melted. 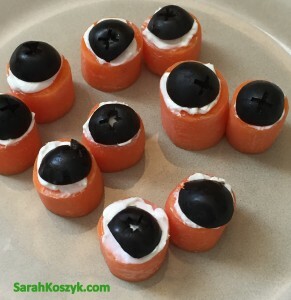 How to make them: Cut the rounded tips of the baby carrots off and discard (you need both sides of the carrot flat). Cut the carrots in half. 1 carrot will make 1 set of eyeballs. Cut the rounded tips of the olives off so 1 olive makes 2 rounds. Spread the cream cheese on the baby carrot. Place the olive round on top. 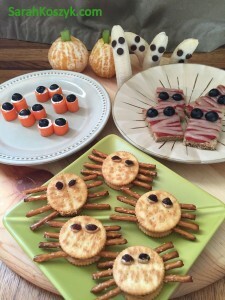 Share in the comments below what fun Halloween treats you enjoy making. Sarah, I love the mummy pizzas. I’m going to make those for my daycare kids. The pumpkins are great too. Yeah! They’ll have so much fun eating it! The mummy pizzas look fun! They’re my favorite. I remember growing up and my Mom would make mini pizzas at parties. They taste even better when they’re mummies. I’ll be trying these even when it’s not Halloween for my grandson. Made potato salad with purple potatoes for pot luck at work. The mayonnaise also turned purple. Not spooky but definitely different. So cool! 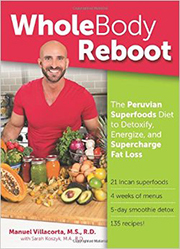 It’s fun making “entertaining” and creative food. Definitely adds more “flavor.” Thanks for sharing!